Romulus, Michigan (June 13, 2014) — Detroit Radiator Corporation is excited to announce that it will be partaking in the Great American Trucking Show (GATS) again for 2014. The GATS, one of the largest trade shows in the heavy duty trucking industry, will be held at the Kay Bailey Hutchinson Convention Center in Dallas, Texas, from August 21-23, 2014. Detroit Radiator Corporation‘s 80 x 30 foot, state-of-the art exhibit (# 18080) will highlight its award-winning, 18-wheeler truck & trailer, “DR·COOL”! The company exhibit will showcase aftermarket cooling product solutions, brochures, awards, sponsorship memorabilia, company history, and video presentations (including a DR·COOL customization video, created by Outcast Kustoms that was featured on CMT – Trick My Truck). There will be cool giveaways and fun contests with lots of prizes. And, key company representatives will be on hand to answer questions. “Our main objective is to give back to the trucking industry and its people as they have made us what we are today,” says Randall Pruitt, CEO, Detroit Radiator Corporation. 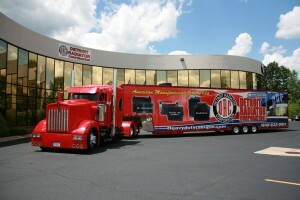 “Interacting with trucking professionals as they explore our products and services in a fun setting is priceless. We want to hear about the real issues in the industry that affect their businesses. We strive to keep learning, share thoughts, and offer advice,” added Pruitt. GATS 2014 will welcome nearly 500 exhibitors representing major truck and trailer brands, component suppliers and others aligned with the heavy- and medium-duty truck markets. Over 46,000 industry personnel registered for GATS 2013. Other show highlights include a recruiting pavilion, new hardworking trucks pavilion focused on class 1-5 trucks, educational sessions produced by the Texas Trucking Association, Pride & Polish National Championship and special programs like Overdrive’s Most Beautiful and the Overdrive/Red Eye Radio Trucker Talent Search. Headquartered in Romulus, Michigan, Detroit Radiator Corporation is a premier manufacturer, re-manufacturer and distributor of aftermarket cooling product solutions serving the HD transportation, commercial, industrial, and agricultural industries. As the most recognized and trusted brand in its market, Detroit Radiator Corporation offers the widest variety of aftermarket HD radiators, charge air coolers and A/C condensers, provides manufacturing excellence, utilizes top safety standards, and delivers almost every product that it sells within 24 hours.